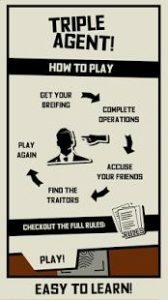 Triple Agent is a party game full of hidden identities, backstabbing, bluffing and deduction. No setup! Just pick up your phone or tablet. Learn as you play! No rules-reading required. Nobody’s left out! The device itself will guide your game. Different every time! Random sets of operations make every game feel fresh. Short rounds! Play a quick game or several rounds. Simple and highly entertaining! Would be great to preserve progress so that game can be resumed at interval, instead of forcing a time limit per move and losing game state when app is closed. The app works great. Rules are deep enough that it takes a bit to get them down, but simple enough to learn quickly. This might be my new go to.